Wild. Crazy. Epic. Unreal. Surreal. Catch me in a conversation these days (or peek into my thoughts) and you’ll hear these words very frequently. Why? Walking around without a big belly, catching myself feeling weirdly light. Totally Wild. Trying to figure out everyday life with meals, work, adventure, naps and a somewhat clean home (whaaat!?). Every aspect of Crazy. Going back to memories of Avalons birth and all that surrounded it and realizing that it actually happened. Seriously Epic. Watching Fabian with two (!) beautiful kids on his lap, both of whom resembles us. Incredibly Unreal. Stopping in the midst of all the things going on to grasp the fact that all while feeling like ’just me’ I am now a mother of two wild princes. So, very Surreal. I actually had a whole other post (the coolest cake ever, folks!) planned as the first one after Avalons arrival but doing anything apart from nursing, breathing, eating and semi-sleeping (especially making and shooting super rad cake) is just not happening when you have a newborn and an energetic 2 1/2 year old in tow. Instead I present to you my ’Granola Gravel’ because anything that’s easily assembled, quick to make, chunky, crunchy, sweet (but not overly sweet) hits the spot in my book. It’s vegan, grain-free, sugar-free and pumped up on essential fatty acids and protein to make for a very satisfying snack without the sugar spikes. 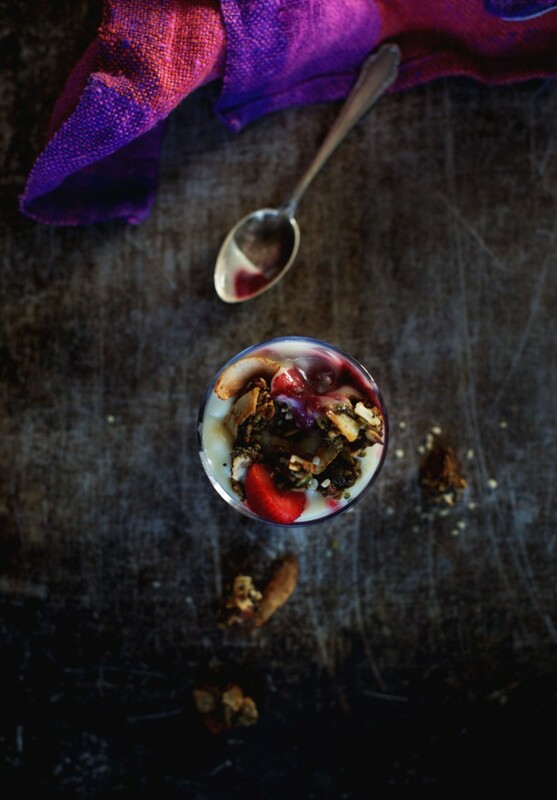 It goes perfectly with just about anything from a breakfast (check out my app for inspo! ), desserts or Caspians snack bowl. Honestly though, it’s at it’s best by the handful right out of the jar like when I get struck by serious nursing-related hunger in the middle of the night. 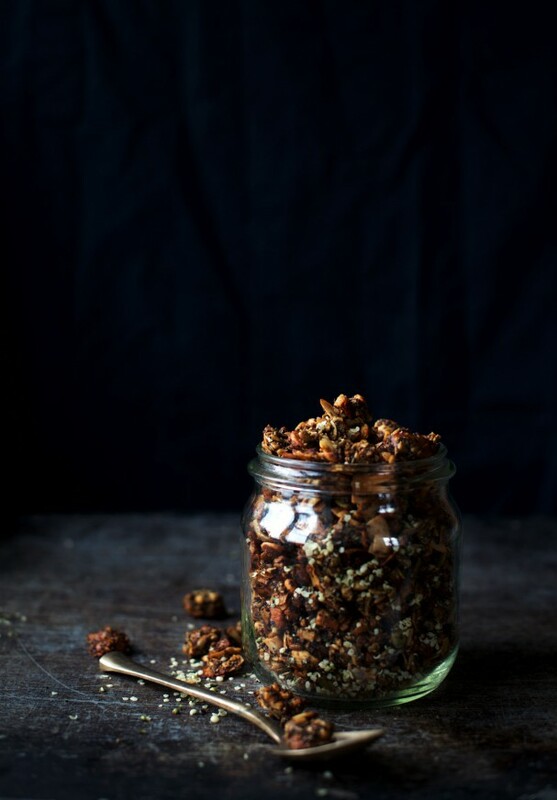 The clusters (thus ’gravel’) of deliciousness that makes up the Granola Gravel magically seem to be just what I (and anyone who tries it) crave. I always try to have our pantry stocked with a jar because when it’s there, life is just better & easier. The Granola Gravel is loaded with good-for-you-ness and it’s ridiculously delish with it’s naturally sweet, nutty & crunchy poppyseed & chamolille tasting toasty clusters.. Guuuh. So. Good! I am a huge snacker. Seriously, I really don’t know anyone who lights up as a firework when it’s snacktime like I do. Granted, sometimes it’s nothing, sometimes it’s just a sad ol’ carrot in the car but other times it’s well though out and devoured with a steamy cuppa. It’s as much a quick but heavenly breathing-space as it is high quality fuel for the next hours ahead. Each and every body works differently but we all need to load up on the good stuff to keep going. Weather that means three solid meals a day without snacks or if it means 3 solid meals plus 3 light snacks doesn’t matter. Some days you’ll need less and some days you’ll need more depending on level of activity, age, season and a bunch of other variables like moontime, if you’re down with a cold or if you are dealing with a lot of stress. Sometimes a snack is solid and sometimes it’s a juice/smoothie/tea. Basically, there are no rules but to follow the needs of your body. There are of course some badass tips and tricks on how to snack smart, regardless of who you are and what’s going on in your life. As a rule of thumb, look at your output of energy of the day. Are you working out? Pregnant? Sitting by a desk all day? Let your input of energy (your food) match that output and you have a good start at figuring out exactly what you need. 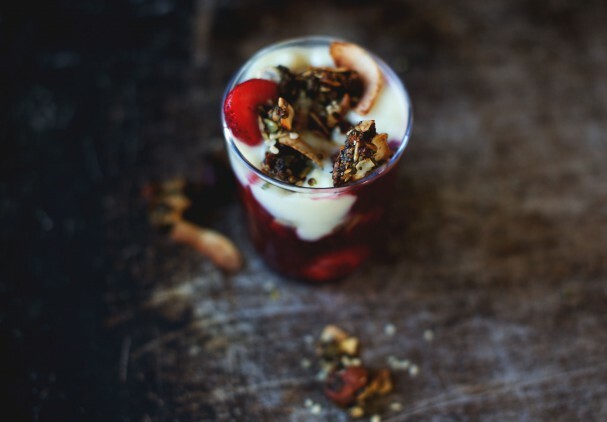 Many have been brought up to lean on overly sweet and/or processed snacks like energy bars, sugared trail-mixes, sweet yoghurts or baked goods etc so my best tips are to go fresh and go savory. 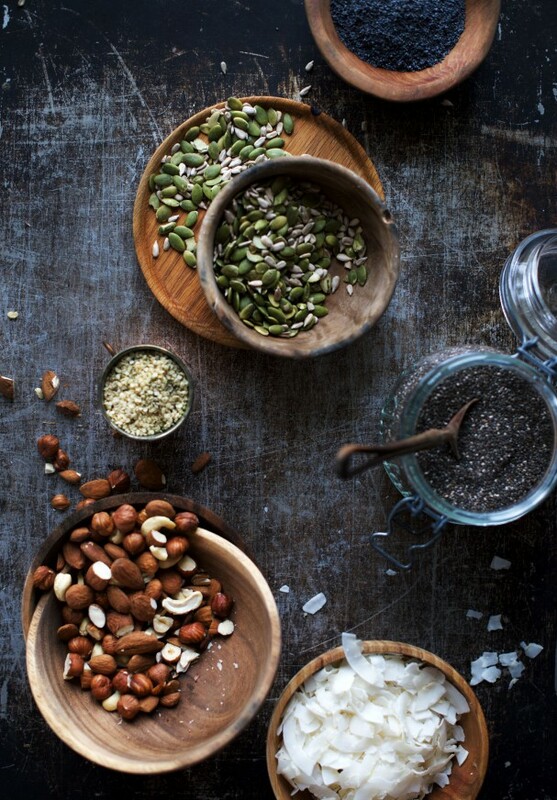 An easy switch that offer a bigger array of nutrients (and keeps you satisfied for way longer). My basic go-to’s that I can easily prepare in batches & pack to take with me are: celery + carrot sticks with a tahini/nutritional yeast-sauce, chunky cucumber rounds with hummus & chili flakes, thinly sliced kohlrabi with herbsalt is magical and a cup of store-bought instant miso has saved me many times! Then I throw in a couple of Granola Gravel clusters because it’s sweet without the s-w-e-e-t and simply all-around awesome ! Actually, my advise is to always have some Granola Gravel in your bag for the times that you forget to pack a snack. It’s a lifesaver if/when Caspian gets a sudden tired/hungry meltdown too. 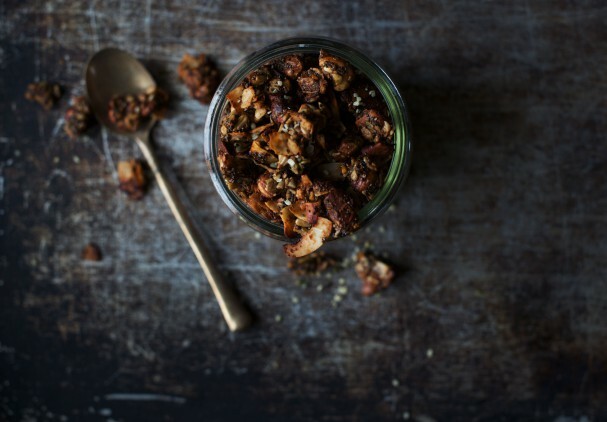 A seriously next level trail mix that you just need in your life asap. Chunky, crunchy, grain-free, vegan, naturally sweet and with an interesting depth of flavor. 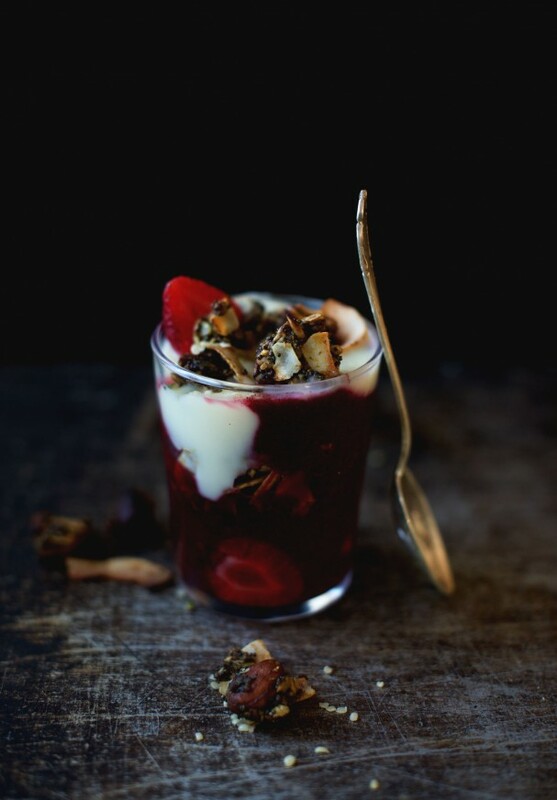 Use it for snacking, smoothie bowl topping, porridge crunch or as a layer in a dessert trifle. It brings a hefty dose essential fatty acids and protein to anything and it’s wildly delicious. Flavor it! 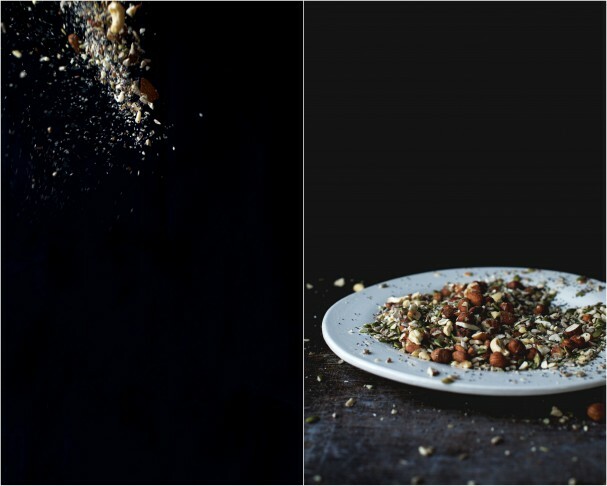 My favorite flavor is freshly ground cardamom+chamomile (included in the recipe below) but I’ve also tried lavender+cacao and ground dried orange peel+cinnamon. You go play! Gently melt coconut oil a small saucepan over low heat. Set aside. Add banana, chia seeds, cardamom, chamomile and date syrup/molasses/maple into the saucepan and blend with a hand blender. Set aside. 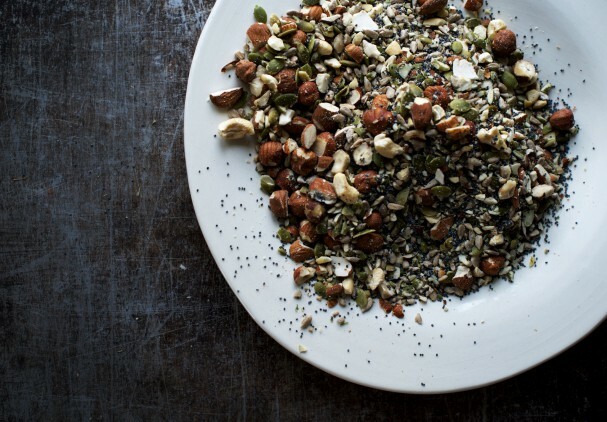 Add nuts, seeds and poppy seeds to a food processor and pulse 2-3 times (alternatively roughly chop them by hand). Add these to a large bowl along with the wet mixture and the coconut chips. Combine until all dry ingredients have been coated in the wet mixture. Spread out on a baking sheet. Not neatly & evenly but rather quite messily and in clusters. Bake for 35 minutes, stirring halfway and keeping a close eye towards the end + stirring once or twice not to burn. Add hemp hearts immediately after removing from the oven and then let cool completely. Store in a glass jar in your pantry. The nature of love is without limits and in our home and hearts it continues to expand into a new reality that is becoming a family of four. Tired and overwhelmed at times, yes. But ’grateful’ would be to only carefully scratch the surface of describing what’s going on in my soul. See you on Instagram for all of the daily wild adventures! °°Elenore°° ..+ all my boys!